Vegas Nation Mailbag: Elaine Wilson and Gilbert Manzano answer all your burning Raiders questions and comments. I’m going to take full blame for the Raiders’ dud against the Los Angeles Chargers last week. Of course, they stunk up the tiny Chargers’ home venue after I showered the Raiders’ offense with praises on multiple platforms. 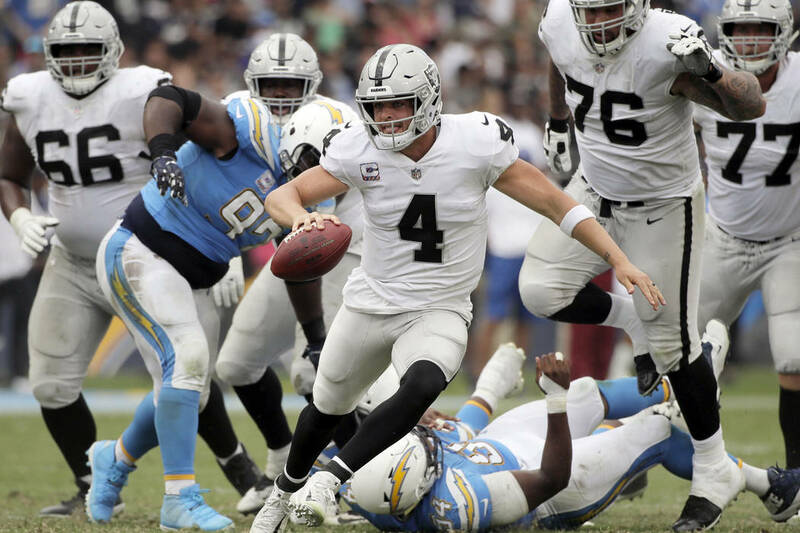 On the Vegas Nation Raiders podcast, I predicted that the Raiders would drop a 40-burger on a Chargers defense that was giving up 30 points per game and minus Joey Bosa. Jon Gruden’s guys only managed 10 points with a season-low 294 yards, a week after racking up a season-high 565 yards against the Browns. “The Raiders played just as bad as the Rebels did this past weekend,” Aaron Hernandez commented on Facebook. The UNLV football team was crushed 50-14 versus New Mexico at home. Whoa. It wasn’t that bad. But, yes, it was a forgetful outing for the Raiders. They need to burn the tape because there was nothing positive from that game. The Raiders need to move on to the London game this week against the Seahawks, and I’ll try not to jinx them anymore. Carr has one bad game and the “he’s scared to get hit” takes return. That’s definitely not his issue. Let’s not forget Carr threw for 437 yards two weeks ago against the Browns and was ranked fifth in the league in passing yards (1,641) heading into Thursday. Quarterbacks who are gun-shy and prefer to dink-and-dunk don’t average 328 passing yards like Carr has through five games. Carr’s problem is that he’s overthinking plays at the line of scrimmage. Gruden said he’s coaching Carr to be aggressive, but Carr should also listen to his gut. The best quarterbacks in the league make the right decisions on the fly. And sometimes it’s OK to slow it down, especially on first down. Just hand the ball off to Marshawn Lynch or throw the ball away. Does Gruden like any Raider drafted before 2018? Even the 2017 first-round cornerback isn’t safe from Gruden’s wrath. Conley, who struggled against the Chargers, was benched for most of the game in favor of Daryl Worley, who returned from a four-game suspension. All offseason Gruden was praising Conley and essentially handed him the starting gig. I was scratching my head at the decision because Conley hardly played during his rookie year. It makes sense now. Gruden was waiting for Worley to return to pair him with Rashaan Melvin. Cornerbacks take time to develop, and Gruden is right — this is Conley’s first “real season.” But let’s hope he doesn’t forget about Conley like he has with general manager Reggie McKenzie’s other draft picks. Here’s a question that came up on the Review-Journal Sports Facebook Live Raiders mailbag show: Should the Raiders tank and trade players? Harry brought up Nelson, Martin and Lynch as players who should be shopped. Might be a little too soon to start breaking up the team with winnable games against the Seahawks, Colts and 49ers coming up. The schedule gets a lot tougher after that, and they might be underdogs in every game, even the one in Arizona next month. Might not be a bad idea to start looking for draft picks if things continue to go south.